Investors were pleased with Mindbody ‘s (NASDAQ: MB) 32% revenue growth in the most recent quarter — the stock is up 13% since that late October quarterly report — but there’s more to this story that just a top-line growth number. Mindbody is in the business of helping fitness studios, salons, and integrative health centers run their businesses using its cloud-based business software and payments platform. Mindbody is not only working to provide great software to run these small businesses, it’s working to make them more successful. In the end, if Mindbody’s customers are growing a satisfied client base, it will be successful, too. There are three metrics investors can watch to see if this formula is working for Mindbody: consumer app bookings, payments volumes, and monthly revenue per subscriber. It all starts with a client booking a fitness class, a spa treatment, or an integrative health appointment. The Mindbody app allows potential and existing customers to easily book appointments online and post reviews. Mindbody customers can also create their own branded mobile apps using the company’s platform. Mindbody estimates that over half of its “inventory” of classes and appointments go unfilled, and sees this as an opportunity. 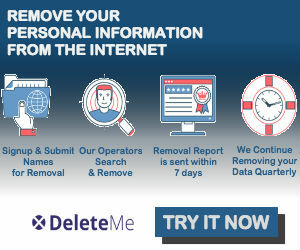 It has recently implemented dynamic pricing to allow its customers to sell spots to the public at the last minute. Image source: Mindbody.investor overview presentation. 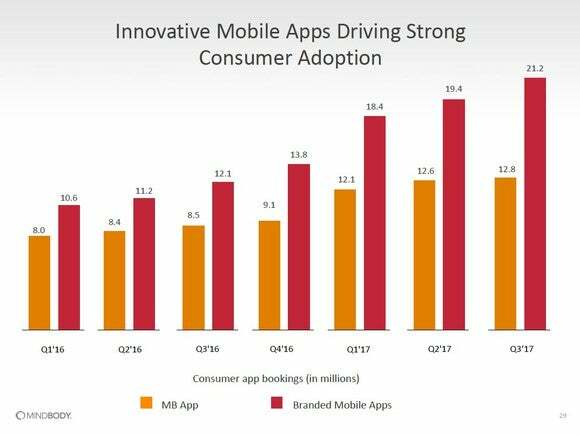 Growth of app bookings has been tremendous. In the most recent quarter, customer-branded app bookings grew 75% and Mindbody app bookings grew 51% year over year. Mindbody reported for the third quarter that 369,000 practitioners delivered 150 million wellness sessions via the Mindbody platform, a 22% year-over-year jump. Of that total, 34 million sessions were booked via mobile app, a 65% year-over-year increase. The company says more than 7.4 million people have created a Mindbody ID to use the mobile app. Mindbody’s software allows its customers to collect payment for goods and services. 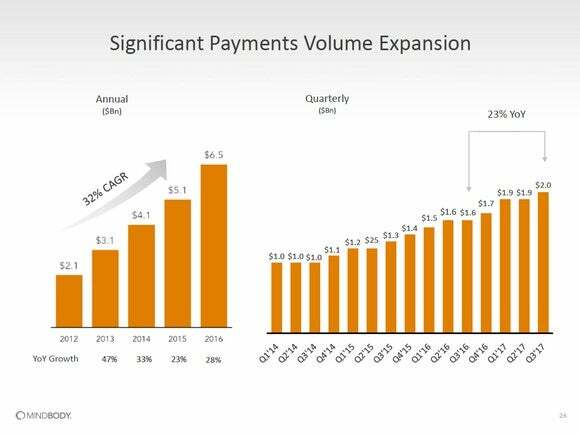 In 2016, the company processed $6.5 billion in payments through its platform, which was a 27% improvement from the previous year. Mindbody makes money on each payment it processes. The company is implementing a new point of sale terminal called POYNT that is integrated with Mindbody’s business app software; has a dedicated customer screen; has a built-in product scanner and receipt printer; and accepts credit cards, mobile payments, and gift cards. This combines a number of hardware devices into one smart terminal experience, simplifying contract signing, on-boarding customers, and collecting payments. The POYNT point-of-sale terminal is integrated with the Mindbody business software platform. Image source: Mindbody. All of these ways for its customers to collect money from their clients helped drive Mindbody’s payments revenue up 32% to $17.8 million in the third quarter, 38% of the revenue for the quarter. The POYNT system is just one example of how Mindbody is giving its customers additional tools to run their businesses and its customers are paying more for these features. 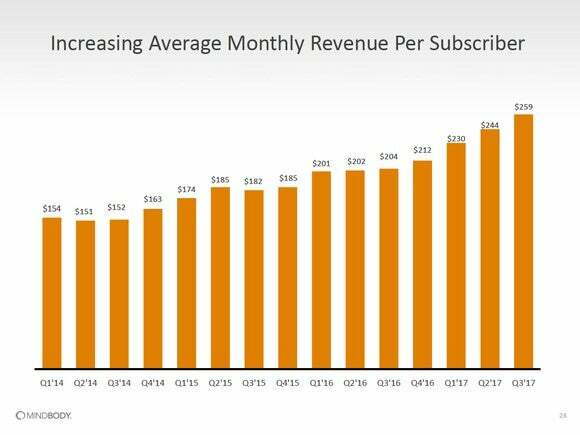 Mindbody reports the total revenue collected per subscriber from all sources (subscription, services, and payments) quarterly. This number has been on the rise for the last two years, and grew a record 27% in the most recent quarter. This consistent increase over time shows that Mindbody’s platform is “sticky” and customers are getting more value from the platform. The new initiatives of dynamic pricing and the POYNT terminal should continue to drive this number in the positive direction. As Mindbody executes on its growth drivers to attract more customers and help them grow, these three metrics will show how effective the company will be in monetizing its platform. David and Tom just revealed what they believe are the 10 best stocks for investors to buy right now… and Mindbody wasn’t one of them! That’s right — they think these 10 stocks are even better buys. Brian Withers owns shares of Mindbody. The Motley Fool recommends Mindbody. The Motley Fool has a disclosure policy .